Emory Saint Joseph's Hospital VolunTeen Madeleine Schwab is bringing smiles to patients' faces and promoting a positive healing environment with her innovative new program called Operation Summer Smiles. 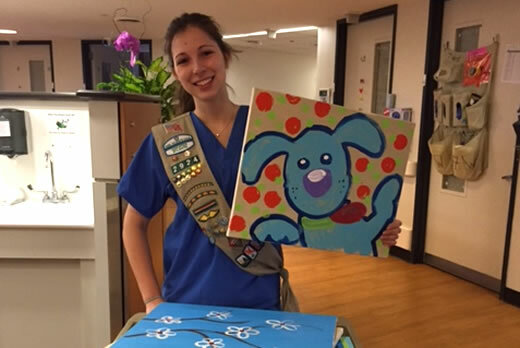 Patients in the critical care and medical/surgical units at Emory Saint Joseph's now have colorful artwork hanging in their rooms for the duration of their hospital stay, thanks to the St. Pius X High School senior. Each week, Schwab travels room-to-room with a cart of brightly painted canvases, letting patients select their favorite painting, which she then hangs on the wall across from their bed. The paintings include frogs, flowers, dogs, cats, zebras and elephants, and she also provides colorful handmade paper crane mobiles and custom window paintings in each patient's room upon request. Fellow classmates and a few parents also lent their support to the project by helping Schwab paint the canvases in the collection. Operation Summer Smiles gives patients a renewed focus during their healing process, and Schwab's intent was to combat anxiety and depression in patients due to stress and extended hospital stays. An aspiring pediatric heart surgeon, Schwab has a personal connection to the well-being of patients, since her father underwent open heart surgery several years ago. Schwab launched this program as part of the Girl Scout Gold Award project, an achievement that will earn her the highest honor in scouting. She has funded the project with prize funds from her Girl Scout cookie sales over the past couple of years as well as community donations. In addition to Emory Saint Joseph's patients, Schwab is also recognizing staff for their hard work. With the help of St. Joseph's Catholic School teachers, she is delivering baked sweets as a thank-you to staff members.